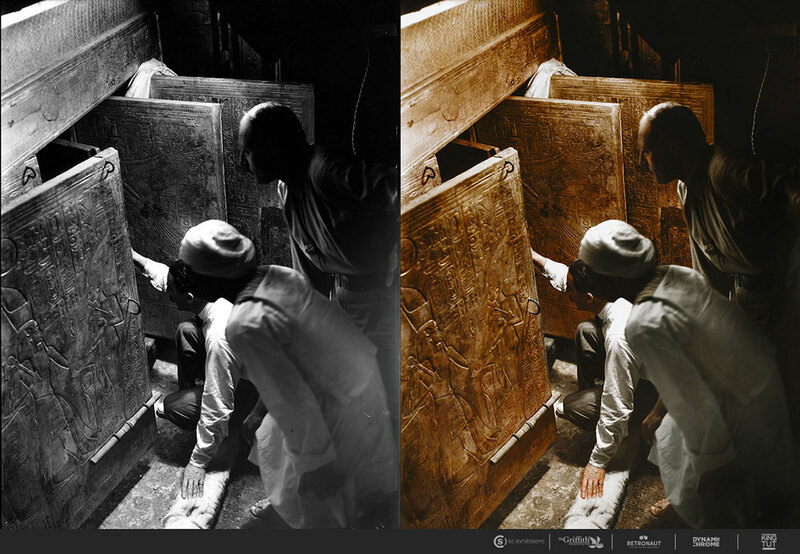 Tutankhamun lies intact with his burial mask on – this photograph was taken as the coffin lid was taken off. The 24 pound mask is made of solid gold inlaid with blue glass and other semi-precious stones, the distinctive nemes head cloth depict the Egyptian goddesses Nekhbet the vulture, symbolising the sovereignty over Upper Egypt and Wadjet the snake upon the brow symbolising the sovereignty over Lower Egypt. Not seen in this famous image is a protection spell inscribed on the back and shoulders of the mask. Carter and a worker examine the solid gold innermost sarcophagus, shown within a gilded, laminated wood coffin of different coloured glass. 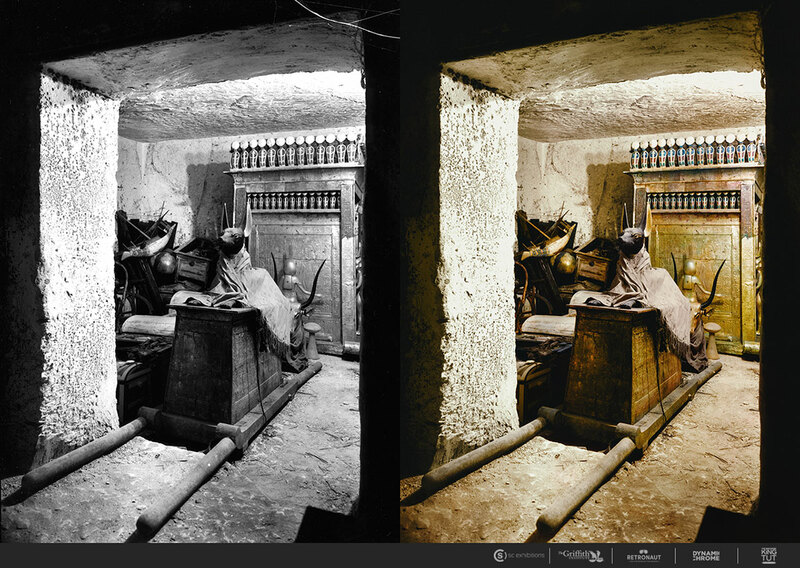 Howard Carter examines Tutankhamun’s sarcophagus. Inside the outermost shrine in the burial chamber, a huge linen pall with gold rosettes, reminiscent of the night sky, covers the smaller shrines within. The mural upon right northern wall depicts three scenes of Tutankhamun in the guise of Osiris, with Ay, the new Pharaoh performing the ‘opening of the mouth ceremony’. On the left western wall are shown various Egyptian deities such as Horus and Maat. Chests inside the treasury made from various materials including ivory, ebony and Egyptian redwood which would’ve contained jewelry, clothing and cosmetics for the boy king. An assortment of model boats in the treasury of the tomb. In all, some 35 boats were located throughout the tomb, symbolic of the transporting the king on his journey through the streams of the underworld towards resurrection. Numerous chariots are stacked up against the wall. A great schematic of the arrangement of the entire tomb can be found here. A ceremonial bed in the shape of the Celestial Cow, surrounded by provisions and other objects in the antechamber of the tomb. The white ovoid shaped objects are food offerings, including one containing beef! Ornately carved alabaster vases in the antechamber, containing perfume. Lord Carnarvon reads on the veranda of Carter’s house near the Valley of the Kings. 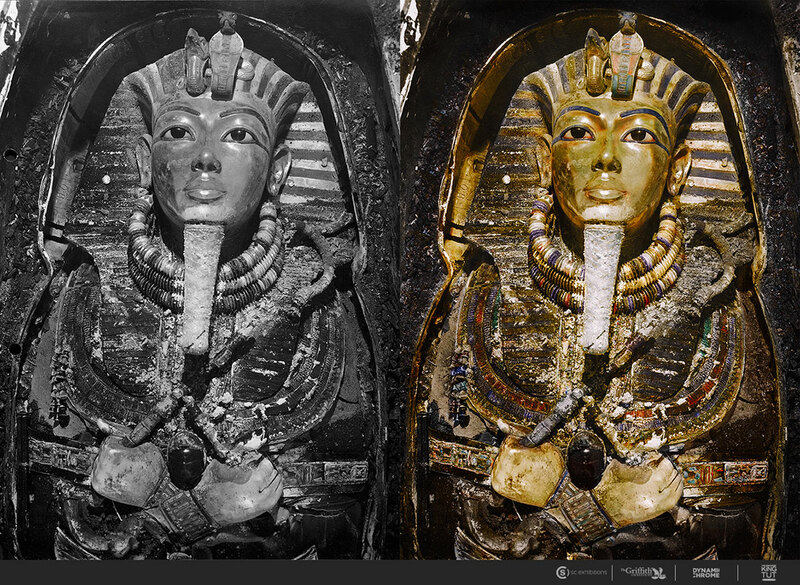 Can you briefly explain the process of colorizing a black and white photo? 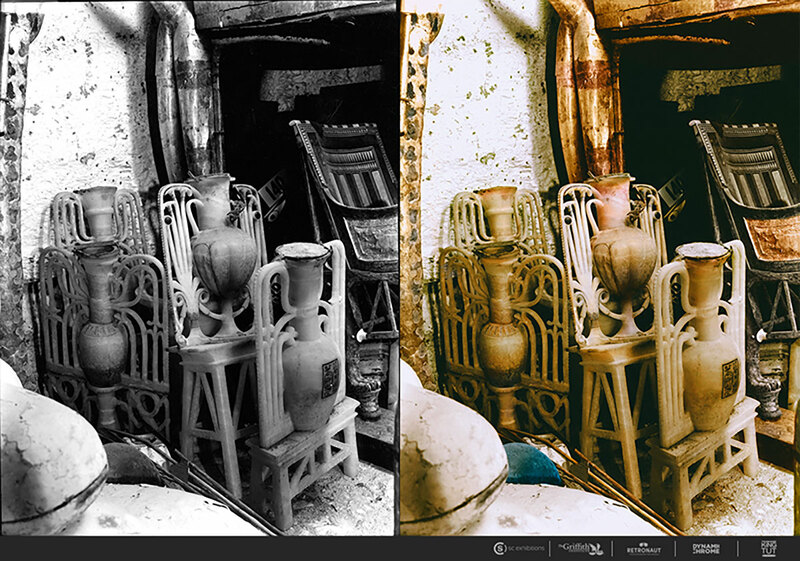 Essentially layers of colour are applied on top of the black and white information on the photograph, a process that has its roots from the very birth of photography as a medium, with skilled artisans applying everything from paints to photomechanical printing onto black and white photographs. Today, we can benefit from the capability that modern image editing software which allows for a very fine degree of control which in the hands of the right colouriser can produce realistic looking results. Each image you see in this set has hundreds of individual layers of colour. 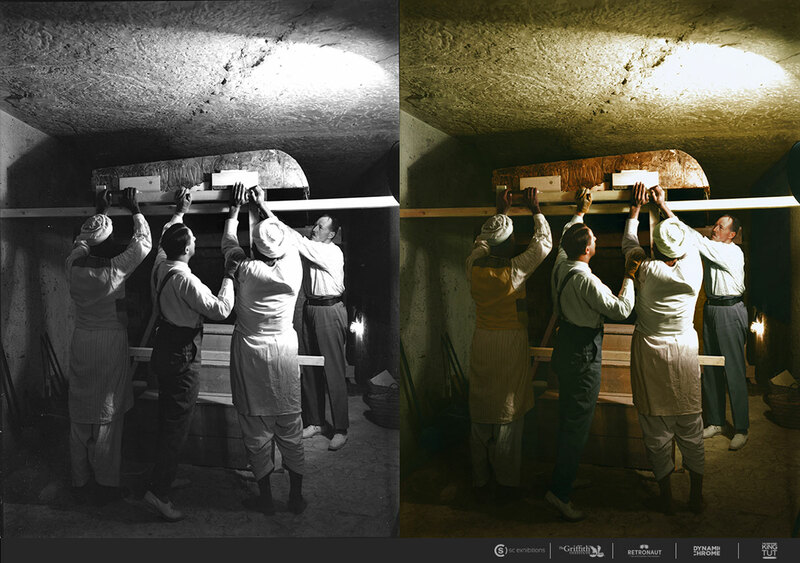 What were some challenges in doing the colorization for this exhibit? Inevitably, the main issue is one of gathering accurate colour references in order to produce a very authentic sense of what Harry Burton was looking at when he took these very meticulous historical surveys. 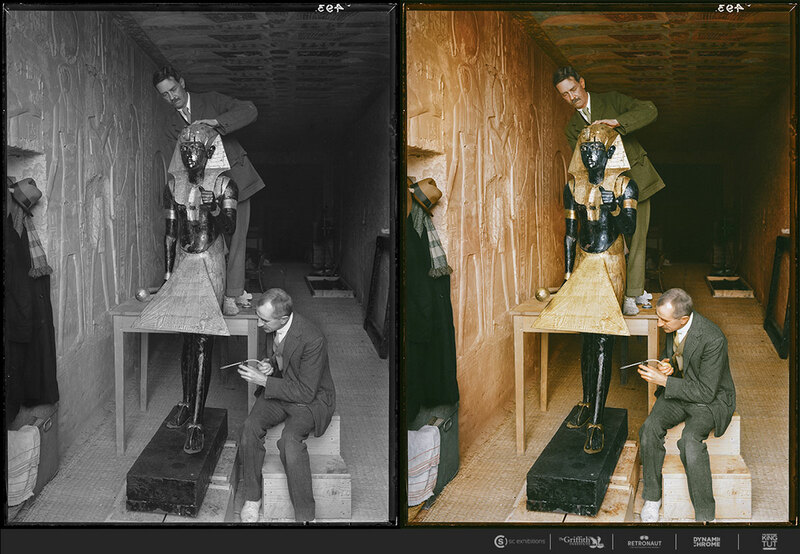 Working with the Griffith Institute and a consulting Egyptologist, we were able to cross reference Howard Carter’s original inventory notes with the restored versions of the artefacts now found across the globe. Once we were able to determine this for each item in the photograph, then we have to adjust for over three thousand years of dust particles in the various chambers and Burton’s own lighting setup. 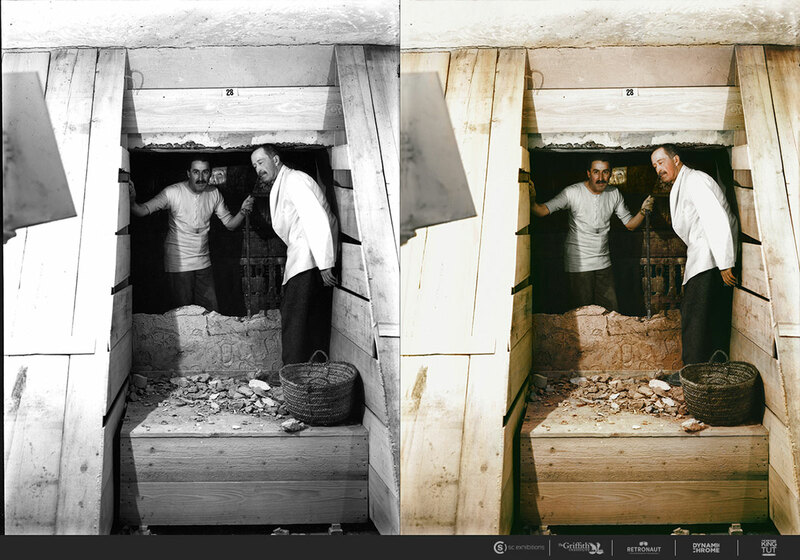 What do you think the process of colorization adds to historic photos like these? We certainly make no claims to substitute a superior historical record – Burton’s photographs are absolutlely unique in their clarity and importance. What we have hoped to achieve is a an authentic sense of what Carter, Burton and their contemporaries were looking at – the precipice of human discovery. I read that Burton had wanted to capture the scenes on Autochrome, an early colour photographic technology, but in the end went with a black and white set up which a way was to our benefit as it was at the pinnacle of its definition which allows us to see the rooms and artefacts in extraodrinary detail. Perhaps now a viewer may experience Burton’s possible intent, without overriding the originals.